Formed in England in 1991, CRADLE OF FILTH generated an immediate underground buzz with their early demos, before stamping their authority on the UK’s burgeoning black and death metal underground with their debut album, The Principle Of Evil Made Flesh, in 1994. A monstrous blend of ornamental terror and pummeling vitriol, it marked the band out as a unique proposition and one of few modern bands capable of driving heavy music forward while honoring its traditions. 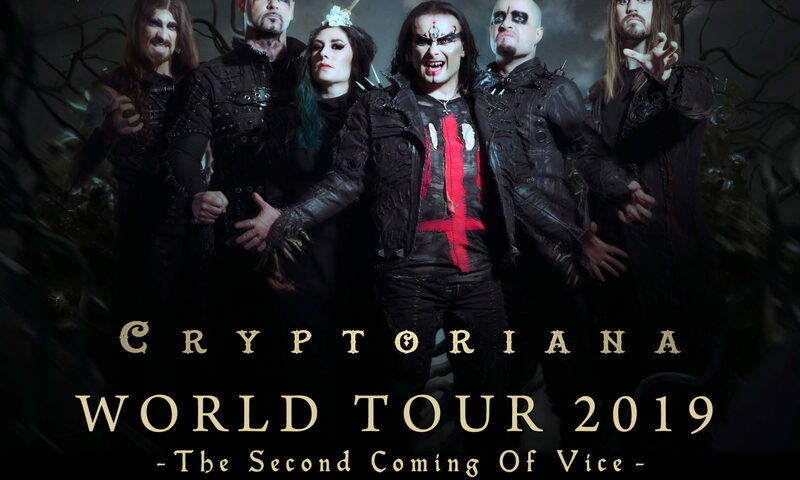 Not surprisingly, a combination of front man Dani Filth’s insanely evocative lyrics and the intensely detailed and the compelling imagery that the band harnessed with great skill have since ensured that CRADLE’s music has both endured and expanded over the best part of three decades. 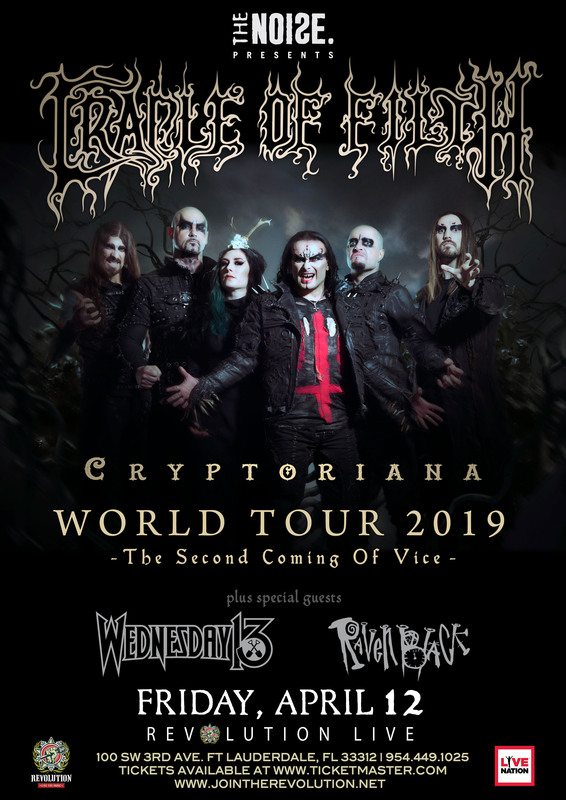 A relentless series of invigorating and enthralling studio albums have kept the band firmly in the bloodshot public eye and despite numerous line-up shuffles and subtle stylistic shifts over the years, CRADLE OF FILTH have slithered from grand triumph to grand triumph. The 21st century has seen the band enhance their allure and fortify their artistic achievements. Early albums like Dusk…And Her Embrace (1996) and Cruelty And The Beast (1998) are widely regarded as classics, but it is more recent feral fare like 2008’s grim conceptual splurge Godspeed On The Devil’s Thunder and, most recently, Hammer Of The Witches (2015), the band’s debut for current label Nuclear Blast, that have cemented and sealed Dani and his cohorts’ reputation and renown. Currently enjoying a collective creative renaissance that is driving them to new heights of elegant fury, the band – Dani, guitarists Ashok and Richard Shaw, bassist Daniel Firth, keyboard & vocal siren Lindsay Schoolcraft and mercurial percussive mainstay Martin Škaroupka – are more potent and devastating than ever before as they approach the release of their latest and perhaps greatest studio effort, Cryptoriana – The Seductiveness Of Decay.